We are pleased to announce that through the State Chamber we have partnered with Blue Cross and Blue Shield of Oklahoma to offer a new membership benefit that will give small businesses and their employees access to affordable health Insurance coverage. 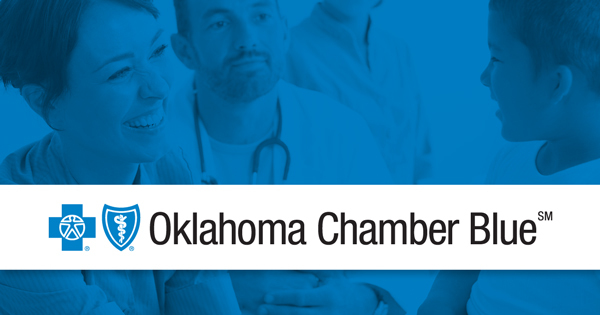 The State Chamber of Oklahoma's health plan, Oklahoma Chamber Blue, is available for companies with 2 - 50 employees who are members of the Northwest Oklahoma City Chamber and/or State Chamber of Oklahoma and located within any of the 77 counties of our state. The Oklahoma Chamber Blue program offers not only medical coverage but also a comprehensive health insurance package that includes options for dental and vision coverage as well. Blue Cross and Blue Shield of Oklahoma (BCBSOK) is the largest and most experienced health insurance company in Oklahoma. They are one of the most trusted names in the industry, providing members with affordable and comprehensive health coverage for nearly 80 years. There are many reasonsto become a BCBSOK member. No medical underwriting Coverage is guaranteed for Chamber members who meet contribution and participation requirements. Blue Options PPOSM, Blue Preferred PPOSM, Blue PPOSM offer more in-network choices than any other Oklahoma PPO with multiple deductible options. Blue Options SelectSM Two deductible options, only available in the Tulsa Metro Area. Office Visit copayments $20, $30, or $35 copayments, depending on the plan you choose. Dearborn National Vision Care Freedom of choice to meet the needs of employees and their families. Prescription Drug 6 tier drug card or deductible /coinsurance plans available. Largest Networks in Oklahoma Coverage in all 77 counties. Blue 365 Member Discount Program BCBSOK health plan members have access to Blue 365, an online destination for health-focused discounts. Health and Wellness Let BCBSOK help you take charge of your health. They offer wellness programs, discounts, and resources designed with your well-being in mind. Tools and Resources Learn more about the tools and resources that encourage you to take charge and maximize your health and download their free apps.